Update: Five extra dates have been added to the schedule. Kanye West has today, June 14, confirmed details of a North American tour via TIDAL. The Saint Pablo tour will begin at the Banker’s Life Arena in Indianapolis on August 25 and will visit nearly 40 cities across the U.S. and Canada including dates in New York City, Los Angeles, Toronto, Chicago, Montreal, Detroit, Washington D.C., and Miami. The tour finishes in Las Vegas on October 29. 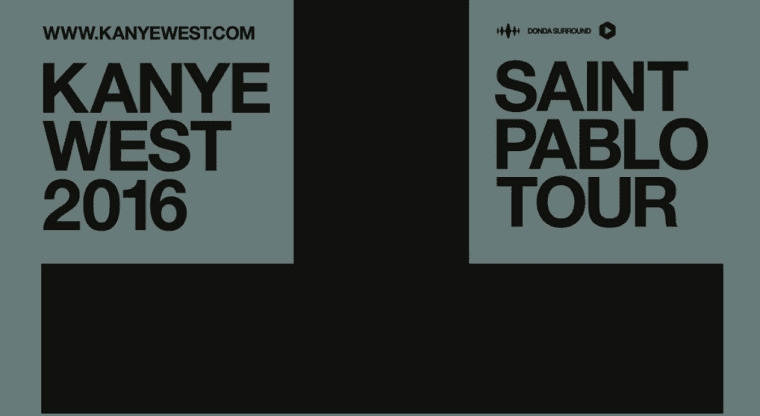 Tickets for West's first arena tour since 2013's Yeezus Tour, go on sale Saturday, June 18 at www.livenation.com. Exclusive pre-sale tickets are available to TIDAL subscribers from June 16 at 10am local time. Update: Five extra dates have been added to the tour today, June 15. The new dates include second dates in Toronto, Miami, and Oakland plus a third night in Los Angeles and a date in Grand Rapids, MI. 08-31 Toronto, Ontario - Air Canada Centre.